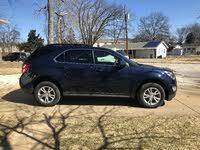 The Chevrolet Equinox midsize crossover vehicle debuted with the 2005 model year as a replacement for the outdated Tracker and quickly established itself as a contender in an extremely competitive automotive segment. Delivering car-like handling, a comfortable ride, a spacious cabin, good fuel economy, and the overall versatility sought by many drivers, the Equinox makes a competent, affordable choice for buyers who seek the roominess of an SUV with the maneuverability and ride of a sedan. The Equinox sits on GM's Theta compact crossover SUV platform, which it shares with such vehicles as the GMC Terrain, the Cadillac SRX, and the new Saab 9-4X, as well as the Saturn Vue, which was the first vehicle to utilize the platform. 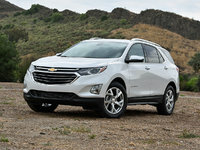 In Chevy's lineup, the Equinox occupies the entry-level SUV slot, positioned beneath the Traverse, Tahoe, and Suburban in terms of size and price. In its market segment, the Equinox measures slightly larger than competitors like the Honda Element and Toyota RAV4, but remains smaller than such vehicles as the Nissan Pathfinder. Direct competitors include the Ford Escape, Volkswagen Tiguan, Honda CR-V, Hyundai Tucson, and Nissan Xterra, among others. The second-generation Equinox debuted in 2010, and most reviewers considered it a noticeable improvement over the first-generation version. For 2011, the Equinox comes in LS, LT1, LT2, and LTZ trim levels, with standard front-wheel drive (FWD) or optional full-time all-wheel drive (AWD). Standard power for all trims comes from a 182-hp, 2.4-liter Ecotec four-cylinder engine connected to a six-speed automatic transmission with manual shifting. The four-cylinder posts fuel economy numbers of 22/32 mpg for front-wheel-drive trims, which drop to 20/29 for AWD versions. Chevy also offers an optional 264-hp, 3.0-liter V6 for LT1, LT2, and LTZ trims. It manages fuel economy numbers of 17/25 in FWD versions and 17/24 in AWD trims. Inside, the Equinox seats five passengers in two rows, with generous headroom and legroom throughout. Cargo space tops out at 63.7 cubic feet with the rear seats folded down, placing the Equinox near the middle of its segment in terms of cargo capacity. Overall, the Equinox currently ranks near the top of its automotive segment, according to a number of reviewers, who like its ride, exterior styling, interior roominess, fuel economy, and overall affordability. The Equinox's powerplants provide solid performance, although the vehicle can feel underpowered at times with the four-cylinder engine. Testers gave mixed reviews to the quality of the cabin's materials when the Equinox first appeared in showrooms, but most feel the interior of the second-generation Equinox represented a step in the right direction. Following its second-generation debut in 2010, the Equinox changed little for 2011, and will more than likely receive some mid-generation updating in 2012 or 2013. In addition, Chevy has experimented with a fuel-cell-powered, zero-emissions Equinox, although the automaker has no immediate plans to make the vehicle available to the driving public. 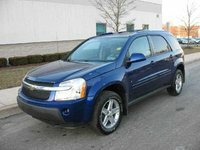 When it debuted in 2005, the Equinox was one of the earlier crossover vehicles, delivering SUV-like versatility and styling combined with car-like handling and ride. Earlier SUVs often sat on truck platforms, and many performed well off-road, but the Equinox was designed primarily for on-road travel, and was not intended to be a serious off-roader. However, optional AWD added a level of stability and traction to the Equinox when traveling on all types of road surfaces. The Equinox's 107-inch wheelbase and 188.8-inch overall length ensured plenty of interior room, as well as competent handling and a comfortable ride. Inside, a versatile interior included a MultiFlex sliding rear seat, which moved forward or back by up to 8 inches to accommodate passengers or cargo, and owners could opt for a power rear hatch in place of the manually operated hatch, which came standard. Initial trim levels included the LS and the LT. Both were powered by a 185-hp, 3.5-liter V6, which was the only engine available. It linked to a five-speed automatic transmission and posted fuel economy numbers of 19/25 mpg, which at the time were considered relatively good numbers for the Equinox's automotive segment. The first-year Equinox had a maximum towing capacity of 1,500 pounds and could be equipped with such optional features as antilock brakes, traction control, and electronic stability control. Leather upholstery and heated front seats were among the other options. For 2007, Chevy expanded the LT trim level into LT1, LT2, and LT3 trims and added GM's StabiliTrak electronic stability control system as a standard feature. New options included a navigation system. However, the 3.5-liter V6 remained the only available powerplant for 2006 and '07. In 2008, Chevy introduced a new Sport trim, powered by a new 263-hp, 3.6-liter V6 engine mated to a six-speed automatic transmission. To improve the sportiness of the new trim, Chevy lowered its ride height, added a body-color front fascia, and removed the roof rack. In addition, the Sport trim rode on 18-inch wheels. Chevy also did away with the LT3 trim in 2008 and added a new upscale LTZ trim, which came equipped with such standard features as leather seat inserts, heated front seats, a premium Pioneer audio system with a CD changer, and 17-inch wheels. 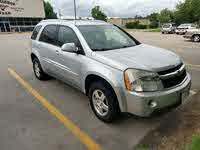 In addition, side-curtain airbags were standard on the LTZ and optional on the other Equinox trims. New standard features for 2008 included OnStar and an upgraded suspension, designed for a slightly stiffer, sportier ride. In addition, Chevy added an integrated Electronic Trailer Sway Control system as a standard feature for all trims. It integrated with the vehicle's electronic stability control system. In 2009, side-impact airbags and satellite radio became standard features and Bluetooth joined the options list. Chevy unveiled the second-generation Equinox at the 2009 North American International Auto Show for the 2010 model year. The second-generation Equinox sat on the same basic Theta platform as the first generation, although Chevy stiffened the frame and stretched the wheelbase to 112.5 inches. Overall length decreased by an inch, to 187.8 inches. The automaker also dropped the Sport trim from the lineup. Exterior updates included a new grille, more pronounced fender flares, and revised headlights, as well as more aerodynamic exterior lines. Chevy also did away with the roof rack and added optional 17-inch, low-resistance tires to help improve the Equinox's fuel efficiency. To help conserve fuel even further, Chevy equipped the Equinox with an Eco drive mode, which made adjustments to the transmission to help conserve fuel at cruising speeds. Drivers could engage the Eco mode by pushing a button on the dash. Despite this driving mode, many testers questioned the EPA's fuel mileage estimates for the Equinox, since many test drivers had difficulty achieving the stated high of 32 mpg with the EcoTec four-cylinder engine. Overall, however, the second-generation Equinox receives positive reviews from owners and testers alike. 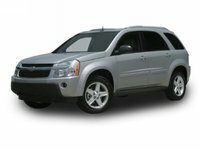 Buyers looking for a used Equinox should start with the 2008 and '09 trims, which were produced later in the first generation and came well-equipped with such standard features as electronic stability control, OnStar, and an upgraded, sportier suspension. Those seeking an even sportier ride should look for the Sport trims, produced in '08 and '09, but missing from the second generation, which debuted in 2010. Chevy greatly improved the Equinox's fuel economy with the debut of the second-generation four-cylinder EcoTec engine in 2010. Although many quibbled about the accuracy of the EPA's numbers, the second-generation trims equipped with the four-cylinder will no doubt provide better fuel economy than any of the other available engines, and should be the focus of buyers who place a value on efficiency. Alternatively, buyers who plan to use the Equinox to haul loads will want to opt for late-model Equinox trims equipped with the new 3.0-liter V6, which boosts towing capacity to 3,500 pounds, up from 1,500 pounds for trims equipped with the four-cylinder engine. AWD trims and those equipped with electronic stability control remain good options for buyers seeking a versatile crossover SUV with an additional level of stability, traction, and control. The 2020 Chevrolet Equinox has been announced, but it is not yet available for purchase. why is battery dead after car setting for 3 months?